First Tracks!! Online Media is available to browse via a dedicated app for Android, Google Play Newsstand for Android and iOS, and a web-app for iOS smartphones and tablets. Each has different functionality, so read on. Our first app, First Tracks!! Online for Android was released in summer of 2011. In fall of 2015 we introduced a new and greatly improved version 2.3. First Tracks!! Online for Android delivers our latest news stories and feature articles to right to your smartphone or tablet in an easy to view format — either live mobile or downloaded for offline reading. Optional notifications alert you when new stories are published. Automatically fetch new articles or retrieve them manually. Share your favorite stories with your friends via email or social media. Interact with your fellow readers in our Liftlines user forums, check snow conditions at resorts worldwide, or check in with our Facebook, Twitter, Instagram and Google+ pages. There’s no better way to bring ski and snowboard news and information with you on the go. And best of all, it’s free! Questions? Check out the FAQ. Google Play Newsstand comes pre-installed on nearly all Android phones, and is available for iOS as well. First Tracks!! Online makes an edition available for those who prefer to read FTO via Newsstand. When Google launched its free Currents smartphone and tablet app for Android phones and tablets, and for the iPhone and iPad in December 2011, First Tracks!! Online was invited to be one of its initial 180 featured publishers. Now it’s called Google Play Newsstand. Newsstand lets you explore online magazines and other content with the swipe of a finger. It brings together this content in a beautiful and simple way so you can easily navigate between words, pictures and video on your smartphone or tablet. At the moment, our edition for Newsstand includes our news and features, Liftlines forum posts (read only) and Google+ feed. Everything is read only, but content is downloaded and stored for offline reading. 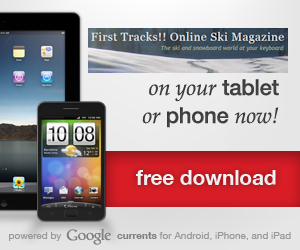 When browsing to www.FirstTracksOnline.com with your Safari browser, you’ll be given the opportunity to save First Tracks!! Online as a web-app, which will give you stand-alone access to FTO from your home screen. If you missed the prompt, don’t fret…you’ll be given the opportunity again when you revisit the site after seven days. Android users enjoy this option, too!